Interested in becoming a member of Kappa Omicron Nu? If you’re a current undergraduate or graduate student and you meet our qualifications for membership, you will need an invitation from your school’s active chapter of Kappa Omicron Nu to become a member. If your school does not have an active chapter, a prospective adviser can apply to charter a new chapter, or can contact the Kappa Omicron Nu national office for information regarding re-activating an inactive chapter. If you have already graduated and are currently a professional in the Human Sciences, you can apply for a professional membership. Note that collegiate membership in Kappa Omicron Nu is ONLY available through an invitation from your campus chapter. Any organization that invites you to membership without a local campus structure in place should be viewed with skepticism, as it is likely NOT a legitimate honor society. 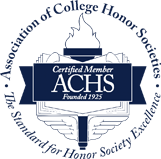 For more information, please see the Association of College Honor Societies’ Informational Alert and How to Judge the Credibility of an Honor Society.